Miss Mabel Chiltern and Sir Robert Chiltern–yes, the brother and sister in real life were brother and sister in make-believe life! This past weekend the Theater Arts Society at The Stony Brook School performed Oscar Wilde’s play, The Ideal Husband. From wonderful acting on the part of the students, to a lovely set design and beautiful costumes that were reminiscent of a by-gone era, the play entertained and challenged. 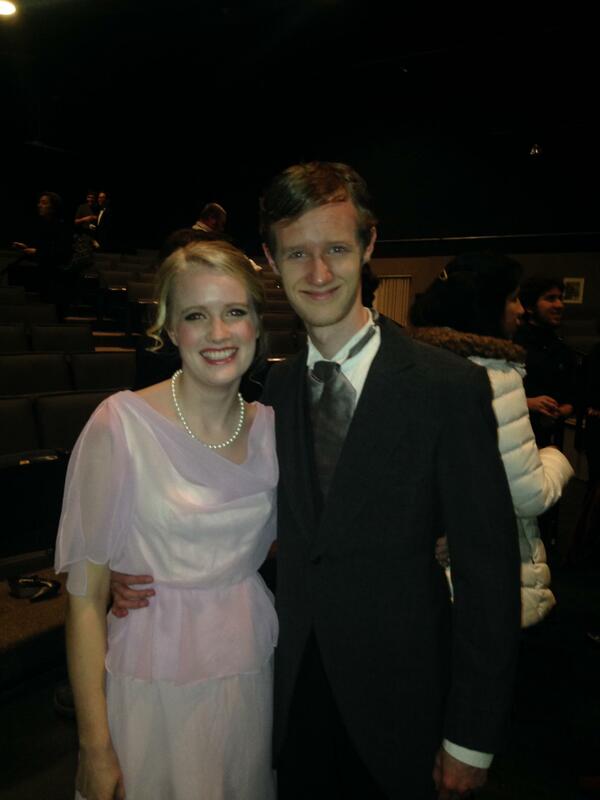 As the mother of two of the actors, (Jake and Anna both had roles) I was proud beyond words. Even Grandma H. was able to be present for the performances! On the last night of the show, I sat behind a fellow colleague and her young daughters. At one poignant moment, I caught a glimpse of the power of theater to speak to the hearts and minds of all ages. A central aspect of the play involves blackmail. Mrs. Cheveley arrives in London to blackmail an old friend, Sir Robert Chiltern (played by Jake). She has a letter that reveals his role in a scheme to make money off of a business deal. After one particularly intense scene between Mrs. Cheveley and Robert, one of the two girls looked at her mom and said in a loud whisper, “She’s mean!” Yes, she was! As a teacher and a lover of literature and the arts, I was reminded once again how children can often perceive more than we give them credit for. Good story doesn’t need sidebars to explain whether or not a character’s actions and motives are good or bad. At least for one child that night, and I imagine many other who were present at the play, our assumptions about people and life were challenged. Many times throughout the play, I found myself “exposed,” so to speak, through the actors and the unfolding story. The power of the written word or the spoken word to reveal truths about our nature is both humbling and inspiring. It can even be a vehicle for redemption. So while the set has been taken apart; the costumes have been returned; the actors have been catching up on missed homework and sleep, the impact of good theater lingers. For this, I am grateful. Anna and Jacob were delightful in their roles! It was also fun to sit in the same row with your family and to watch your faces as you watched your chidren!! Precious moments!! Right on, Alicia. I loved watching Jacob and Anna use their gifts and talents. I thought the dialogue was thought provoking and showed a lot of insight. Oscar Wilde’s touch of humor helped with some of the intensity. The effort and hard work produced by the students was certainly evident. Great memories for me!